Make these easy and delicious BBQ ribs right in the Instant Pot. Remove membranes from baby back ribs. Use a butter knife to loosen and lift the edge of the membrane. Then use a paper towel to grab the membrane and pull off in full sheet. Season ribs generously with kosher salt, freshly ground pepper and a sprinkle of garlic powder on both sides. Sprinkle on brown sugar and season with additional all purpose steak-seasoning, if desired. Add beef broth to 6 Qt Instant Pot, followed by trivet. Fit rib racks into Instant Pot curling them into each other with meaty parts facing out. Add beef broth to Instant Pot and pour barbecue sauce over ribs. Set Instant Pot to Manual, High Pressure for 30 minutes and make sure valve is set to sealing. Instant Pot will take 20-30 minutes to come to pressure and then countdown cooking time from there. Once Instant Pot has counted down from 30 minutes, do not turn the pressure release valve. Let ribs Natural Pressure Release. This will take another 20-30 minutes. Once the pressure pins drops, carefully remove ribs from Instant Pot and place on baking sheet. 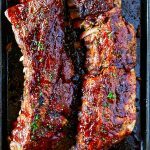 Brush ribs with liquid from the Instant Pot and additional barbecue sauce. Broil ribs for about 5 minutes on high, watching carefully to prevent burning.